Transparency is a very important policy for any public relations campaign. In this article we find a connection between transparency and Wonder Woman’s jet. According to Wikipedia, it all started with an invisible plane that first appeared in 1942. Over the years, that plane evolved into a jet with the ability to travel almost three times the speed of sound and hover in place to allow for tricky landings. In the TV show, we could see Wonder Woman in her invisible jet depicted as a white wireframe that surrounded her. The symbolism of the invisible jet in the era in which it was born may still be relevant to this day, but today we’ll use it to explain a little bit about public relations. Transparency in public relations is about how the public “can see how you got there.” People want to see through the fluff to the heart of the issue, just like we can see through Wonder Woman’s plane to find her and her passengers very much revealed. Bad things happen and often do, but it is how you handle those crisis situations that matters. It’s about openness and your ability to share the right information. This builds trust and makes everything you do visible to the public, so there are no questions or, even worse, insinuations from outsiders looking to mar the company’s reputation when something bad happens. Building transparency shouldn’t appear contrived or fake, especially during a public relations crisis. Being open and honest about your challenges, as well as forthcoming with information, will demonstrate that you are managing the situation and lessen any damaging effects. Honesty, authenticity and requesting feedback are often used to show transparency. And it’s this transparency principle that builds trust and empathy. The general public has become less trusting of advertising and marketing. That’s why it’s important to be honest or you may lose their trust and support. Truth and honesty create authentic messages. You are being honest and forthcoming when you share your challenges alongside your successes. This humanizes your brand. Whether it’s during a crisis or not, clients can gain a deeper understanding of what’s going on, which allows them to be more forgiving and builds empathy for your situation. Empathy is a powerful tool to help you gather feedback and build support. Gaining support can protect you against future challenges or repair any damage that may have occurred during a crisis. The rise in social media has made it easier for PR campaigns to be more proactive and honest about challenges. These platforms can carry your authentic message to a larger audience and be a point of light during difficult times. To take advantage of this, make sure to be proactive rather than reactive. Social media is immediate – you must be agile and get ahead of any problems or social media can work against you. A great PR campaign spots potential issues and crises before they happen. Keep pushing out positive, honest messaging on all channels so when anyone searches for your company, they find the good things first, those authentic messages that build trust. It’s these kind of transparent communications that I believe in strongly, because they let others know that you really do care. This article is part of a series on how Wonder Woman inspires our marketing philosophy. Throughout the year, we will be featuring more on this topic, so let us know how you feel about it in our comments section below. Few things can heighten the suspense of a cop drama like a good ol’ fashioned lie detector scene. The machine has its tentacles on the perpetrator. A large needle jumps for every spike in their heart rate, confirming what was suspected all along. 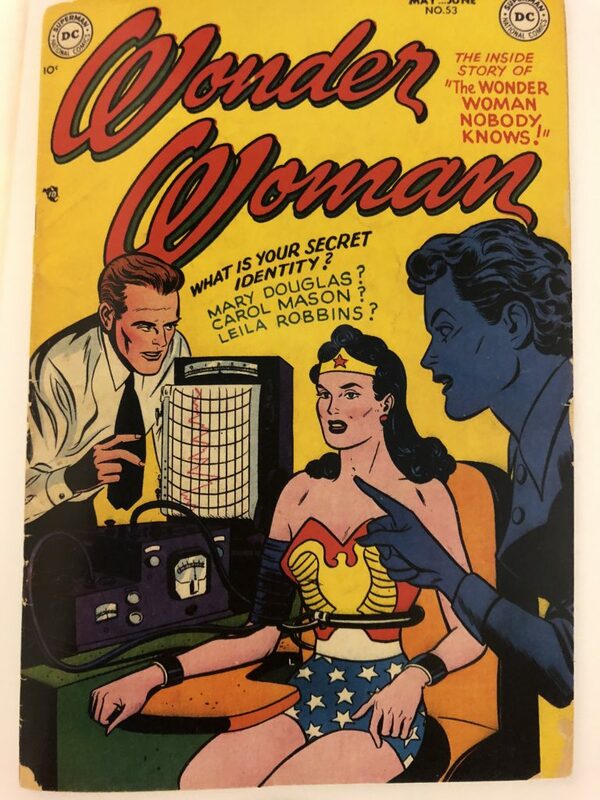 William Marston, the co-inventor of the lie detector, went by the pen name Charles Moulton, and was the author of Wonder Woman. A bio-drama about Marston’s life, Professor Marston and the Wonder Women, was released in 2017 and shows us how he invented the polygraph and why our favorite super hero uses a lasso of truth. She didn’t need a gun or a laser beam stare. An unassuming lasso was her weapon and one of the things we remember most about Wonder Woman. With her lariat, she could subdue anyone and force them to tell the truth. She even used it on the good guys, as we saw in the recent Gal Gadot film, because she needed the truth to understand more about what was going on in the world. Seeking the truth is important for a crime fighter, like Wonder Woman, and it’s also important for marketing. We never want to mislead anyone, because that could have a negative effect on clients and customers. Plus, as an advertising agency, Pinstripe is held to the same laws and standards that dictate how companies are able to advertise their products and services. Under the Florida Deceptive Trade Practices Laws, it’s illegal to make false claims. Things like bait-and-switch and spreading disinformation are also outlined in this law. Any company caught doing this can face extensive fines for each infraction. It’s best to tell the truth and follow the guidelines within your professional community. This is particularly true for the legal, financial and health care industries. Media outlets rely on truth and accuracy in their reporting. As you are probably well aware, they have been tested recently, so they’re getting better at snuffing out potential blowback from their audiences. Because press releases are branding and credibility tools, it’s important for them to have verifiable facts. Any mistakes made could have the opposite effect. Reporters have an uncanny ability to find a different story than what had been intended, especially when the facts are misrepresented. With blogs and social media, the delivery of content has been democratized. The messages we deliver to our audiences are a reflection of our brands and illustrate our knowledge, experience, and thought leadership. So obviously, it is critical that our missives are not only truthful, but unique. There are terabytes of content littered throughout the web, making it increasingly simple to cut and paste bits and pieces to make the job of blogging easier. However, plagiarism makes for a terrible brand image. Original work is truthful work. Think of these messages as having a lasso of truth, making your truth easier for others to see. This article is part of a series on how Wonder Woman’s inspires our marketing philosophy. Throughout the year, we will be featuring more on this topic, so let us know how you feel about it in our comments section below. Remember when getting something from an online store was a bit of a guessing game? Online shopping has changed quite a lot. And, I can appreciate it even more after a recent experience in a store that went sour. I would say that buying something online has become a good experience, almost to the point where it resembles the in-store experience. Most retail websites provide multiple photos, sizes, dimensions, and weight. Checkout is quick and so is delivery. Plus, they have online reps that can answer quick questions, such as return policies and shipping. I consider this a good experience. I have more expectations when I go to a store than simply finding what I need. A good sales associate can make a good experience great, simply by being nice (smiles are contagious) and offering suggestions when asked (knowledgeable staff). Going to the store also connects us with the brands we buy. I think that’s still the difference between the two. The online experience always feel good, while the in-store one can feel great. Except when it’s not great—or even good. In fact, a bad experience makes me wish I had just gone online. A bad in-store experience feels like a bad investment, because my time could have been spent better. No one wants that feeling. This is why good customer service is more important now than ever before. Friendly service is a must. I don’t want to be ignored and I certainly don’t need any attitude. And, research shows how 70% of all purchases are based on how we feel like we are being treated. Everyone has bad days, but they shouldn’t be taken out on others. Knowledgeable staff that is available to answer questions. Odds are, if I’m asking a question about a product or service, it means I’m not 100% sure of it. So, when I need help, I want someone to be available. Convenient and quick ways to pay. I don’t mind standing in line, but not for too long. My most recent bad experience while shopping was because of an unfriendly service representative. There’s too much competition out there. Too many choices for me to take my business elsewhere. Their mistake cost them my business and I’m sure I’m not the only one. My bad experience only strengthens my belief in the value of good customer service. We can’t please everyone all of the time, but we can try our best to be nice and helpful. This also extends to managing some common marketing activities, like social media and customer feedback. When replying to customers, be polite, never rude, or misconstrued as rude. The best way to do this is to be honest. Admit mistakes. Provide alternatives. Give the right answer. Resolve problems in a calm manner. Your customers and clients will love you for it. That’s why good customer service goes a long way.